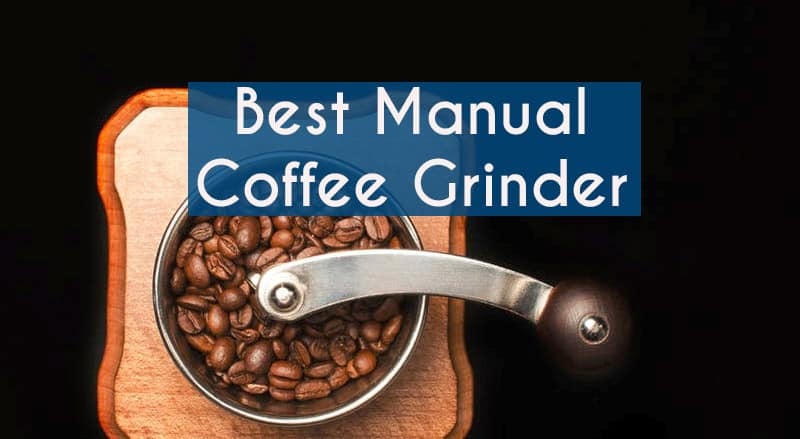 When it comes to getting the best ground coffee, there is no substitute to doing it yourself, and that is why this list will help you find the best manual coffee grinders so that you can experience why to do a job right, you should do it yourself. For coffee enthusiasts, few things are better than fresh ground coffee. But having the time to grind coffee can be a pain, and what is worse is if you do not have a reliable grinder. Fortunately, there are plenty of manual grinders that will not require a long effort on your part. Plus, having a manual grinder means that if the power goes off, all you need is that manual grinder, a French press, and some way to heat up water to have great coffee. Not sure what is the right manual grinder? We have the reviews of several that are not too hard on your wallet while also delivering consistent grounds that will make every cup of coffee that much more satisfying. Check out the table below for our top picks. The simple answer for why you should grind your coffee goes back to the most basic elements of how you brew coffee. What you need is hot water, grounds, and some way to strain the liquid that absorbs the grounds. Whether it is a drip coffee machine or a French press – even espresso machines as well – require a consistency to the size of the coffee grounds. By having your coffee beans go through a grinder before they ever make contact with water, you are guaranteeing the freshest coffee possible. The other reason you should grind your coffee is based on the type of coffee you wish to drink. For example, espresso requires very fine grounds that need to be packed densely into a filter while a French press needs large, consistent sized grounds. For a regular drip coffee maker, grind size is less important but it does matter when talking about the strength of the coffee. The other reason you should grind your coffee is because freshly ground coffee has the most profound taste. Once coffee is ground it is susceptible to contamination from the surrounding air. This is also why your coffee beans should be kept in an air tight container. When you have your coffee beans stored properly and grind them right before placing them in the filter to brew your coffee, then you are guaranteed to have the best cup of coffee. Precision is one of those qualities that separates the contenders from the pretenders, and when you are precise, quality will always follow. Ask yourself this question, when was the last time you were precise and missed the target by a mile? It does not happen, and that is why people love the JavaPresse Manual Coffee Grinder. 18 different settings means that you can get the exact right type of grind for the specific brewing technique you prefer. Do you like French press? Turkish? Espresso? Cold brew? Drip? A brew that has yet to be discovered? Fortunately, these 18 settings can get you the right consistency on every grind! Besides precision, the conical burr grinder means that you do not have to deal with the maddening inconsistency of a blade grinder. The hand crank is quiet and easily removable as well. Another great feature to this grinder is how quiet it is. So, if you are the first one to wake up in the morning and you are trying to keep the peace in the home, this grinder will make sure that you do not become the person who acts recklessly and wakes up everyone else with a loud grind. As for the problems with the JavaPresse, well, they are relatively minor but are worth talking about to give the full picture of what you will get. The biggest flaw is that for holding the grinder can be difficult because there is not a good area to get a sturdy grip. Also, you may have to replace the burr from time to time, and for those who are not handy this can turn into a terrible inconvenience. Overall, the JavaPresse provides the most consistent grinds thanks to its precise design. You would be hard pressed to find a manual coffee grinder that does a better job at such a good price. When you think about premium products, one thing that they have to do when pricing is deliver with alarming consistency. If something is priced beyond what its competitors are and fails to deliver the goods, then what you have is a clearly not a premium product and people will eschew a product based on that fact alone. So, when Handground made their coffee grinder and put the prohibitive price on it, they knew that there was no excuse for poor performance because a bad performance means that no one would respect this grinder and it would go by the wayside. 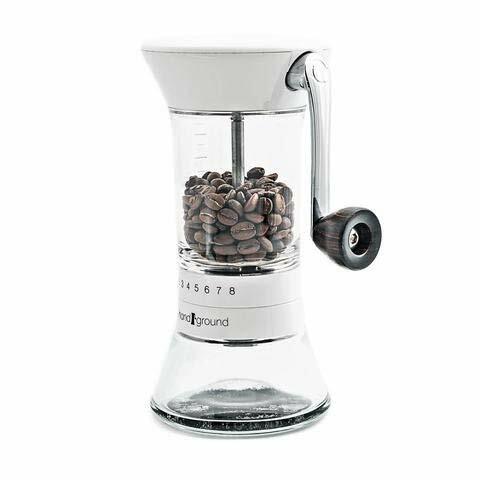 Fortunately, Handground made a fantastic coffee grinder that fulfills the needs of even the most discerning of coffee snobs. There are 15 different settings and the ceramic burr all but guarantees consistent grounds for everything from espresso to French press. One of the best parts of the Handground grinder is the magnet that is included. Instead of using brushes and all sorts of gadgets to clean the grinder, the magnet does a great job and loosening those stray grounds and giving you the clean grinder you need to produce great coffee. Of course, nothing is perfect and in the case of this grinder, there are some flaws as well. The first is the price. When you get this particular grinder, it is natural to wonder just what the heck you were paying for. Nothing about it seems truly premium. Then combine the fact that this grinder has a tendency to wobble as you grind. The wobbling presents a real problem as it will affect the consistency of the grounds along with just being a general pain to deal with. Overall, the Handground is a good grinder but it costs a steep price. There are things that many people will love, and no doubt, they deserve to love it. Ultimately though, unless you are completely married to this particular model, it is best to pursue a grinder at a more modest price. When you work in the old-fashioned ways it is natural that you would appreciate manual coffee grinders; these grinders pay homage to a simpler, easier time. There is absolutely nothing wrong with that, and often what we miss about those old days is how simple everything was. For 3E, this idea was the driving force behind their manual coffee grinder. A simple canister and hand crank along with an easy to open and close latch means that your coffee grounds are given the appropriate respect that they deserve. There are no frills here – this grinder exists to simply give you the most consistent grounds possible so you can enjoy whatever type of coffee you prefer. Simply grind your coffee, open the canister and voila – coffee is served. This particular grinder is also hand adjustable. No, it does not have settings and for some that can be really irritating, but the truth is having a grinder that is adjustable allows you to choose your preferences more organically. If you are a coffee aficionado, then this grinder is right in your wheel house. There are some problems with this coffee grinder unfortunately – because even in the good old days, nothing was perfect. Besides the lack of true settings, many people have reported problems with the handle and that it tends to bend quickly and thus does a bad job grinding. Ultimately, this coffee grinder does a great job at keeping things simple, but for many, the simplicity of the grinder is ultimately its undoing. 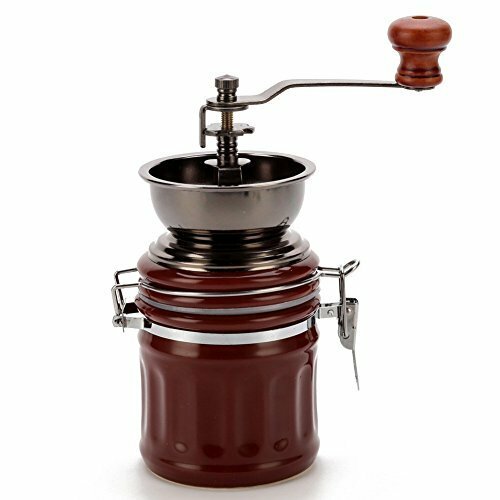 If you have always liked how antiques look and enjoyed the old timey feel they impart to their tasks, then there is a high level of appreciation you will have for this particular coffee grinder from Foruchoice. The grinder itself uses a cast iron crank and gears, meaning that you will have something that is quite durable and will stand up to repeated use. Just like antiques, this is built to last. However, like with many antiques, it comes with a steep price. Though the Foruchoice is not an antique coffee grinder, it is a good replica. 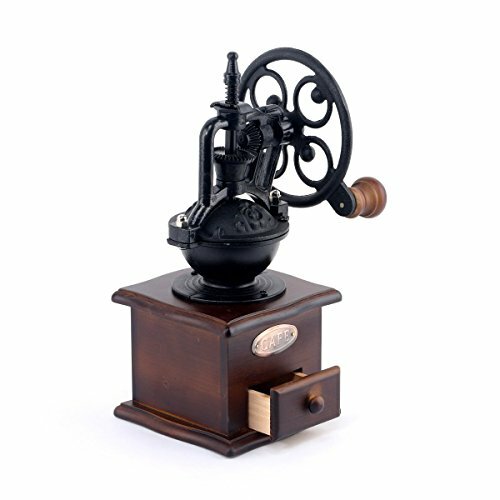 If you are interested in an antique coffee grinder that actually grinds coffee, then it is worth looking at the prices for them, however the price here is attempting to justify itself through the cast iron tools and the old style. For a true antique coffee grinder, the best place to look would be at a local thrift shop or a more refined antique shop. Regarding how it works, the design itself is relatively simple to use. Just fill the hopper and turn the crank, then open the powder box at the bottom and you have your ground coffee. You will fill as if you just stepped off the set of “Tombstone” with the old-timey atmosphere this grinder projects. The drawbacks are simply the price and how you have to manually adjust the settings. For people who want a specific grind, it is not as easy as you think to get that type of grind. Ultimately, this is a fantastic coffee grinder if what you are seeking is something that has a unique design, but the reality is if you are not passionate about the design, you might as well pass on this grinder. Keeping it simple and easy is how the KONA coffee grinder sets itself apart. Instead of a crazy design or gimmicky features, the KONA is all about grinding a great cup of coffee. How simple is it? The grinder holds just enough beans for two cups of coffee, meaning that you will not have excess grinds, excess beans, and ultimately coffee that needs to go down the drain. Instead, what you will have is the right amount of coffee for the occasion. 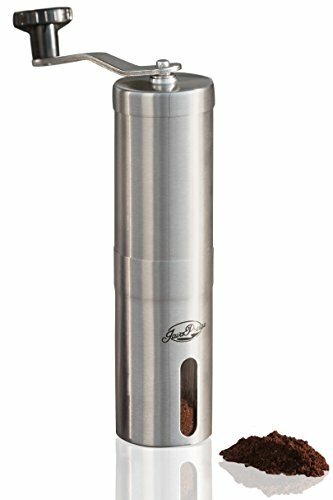 This is the perfect grinder for camping or if the power goes out. The glass carafe at the bottom is perfect to catch grinds, and the axel allows you to easily adjust the different settings. Unfortunately, though, there are some issues with the KONA. 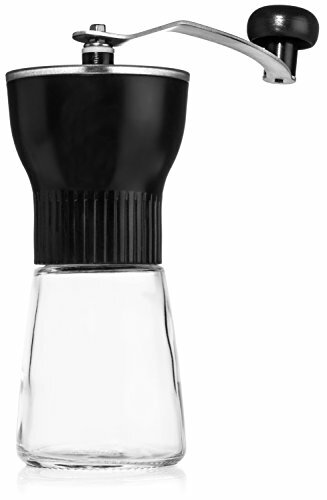 The biggest issues involve problems with the knobs falling off the handle and the glass carafe itself is prone to break. While glass is a fantastic way to handle coffee grounds, there have been more than a few instances of the glass breaking. Unfortunately, it is an understatement how dangerous this can be. Durability is not a strong suit of this particular grinder, and it’s a shame because the grinder itself has so much potential for greatness. Ultimately, you can get a lot out of the KONA – make sure you take care of it and be careful with the glass carafe. Caring for your coffee beans is critical to getting the best possible grinds and thus, getting the best flavor. The key component to taking care of your coffee beans is making sure they are in an air tight container as detailed above. There is more to it though, one thing that many people do is put their coffee beans in the freezer. This is a problem because it actually causes the coffee beans to absorb more of the air around them. So, if your freezer has anything that’s been lingering the coffee beans will absorb this. Same goes for the refrigerator. The other considerations are making sure the coffee beans are out of an area that gets hot. This means if you store them in an air tight container on the counter, put them in a place that does not get too warm during the day. This will guarantee they remain as fresh as possible. Grinding your coffee beans is a worth endeavor. The manual grinder provides that handcrafted feel and exceptional taste. The manual grinder is something that you can use for many different functions from French press to espresso. Make sure you check out the reviews so that you get the best possible grinder for whatever coffee you would love to drink.